I am so late to the Desmos party! I used to think Desmos was just an online graphing calculator, but it is so much more! 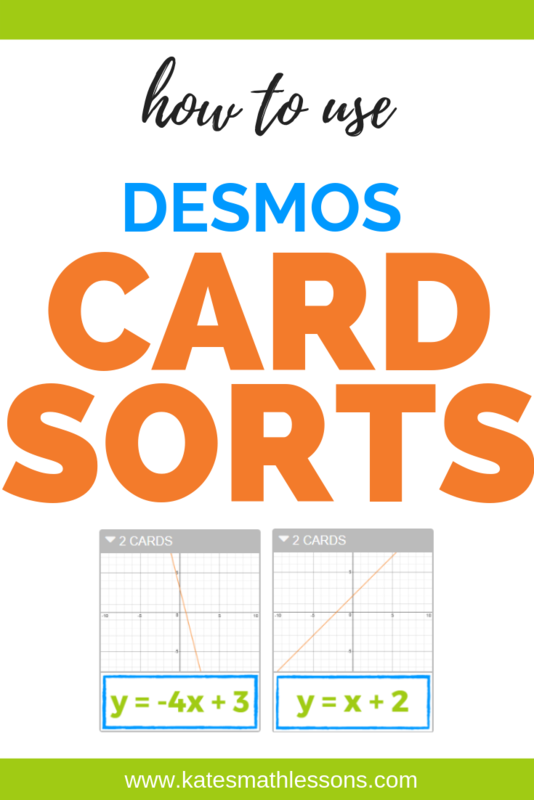 The team at Desmos has developed so many great activities and I recently discovered the card sort feature that is AMAZING. In a nutshell, a card sort is a digital matching activity. You can use it for about any activity where you want students to categorize or sort things. 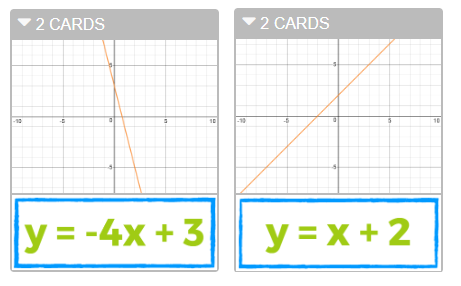 I created a Graphing Linear Equations Card Sort to show you how it works! They keep moving the cards around until they get all the cards matched up. But the best part (in my opinion) is the teacher view while they're working! I am kicking myself for taking so long to discover this. Teachers can see student progress as they're working! It will highlight correct matches in green and incorrect matches in red. Such an easy way to see which students need help as they're working! You can even hit the "Anonymize" button if you want to display this up front for the whole class to see. 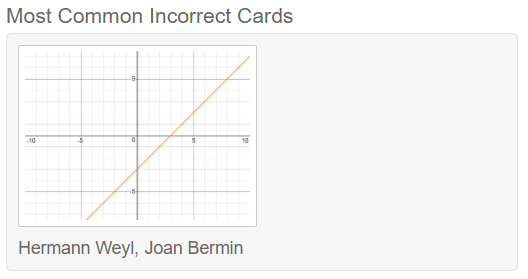 Desmos also lets you see an overview of which cards students are getting wrong so it's easy for you to address some common misconceptions students are having. It's so easy to share the activity with students when you're ready for them to try it. You hit the "Create Class Code" button (you'll want to create separate codes for each class period). After you create the code, you'll get a screen like the one below that you can display for students or share the link with them in Google Classroom, Moodle, etc. They can create their own Desmos accounts if you want or they can do the activity without signing in (it just has them type in their name before they start). Just an FYI, you can use the code you see above to test it out but the results will show up in my Desmos account, not yours. You'll want to grab the link below and make a copy of the activity in your own Desmos account so you can see your student results. Click the button below to try the activity for yourself! 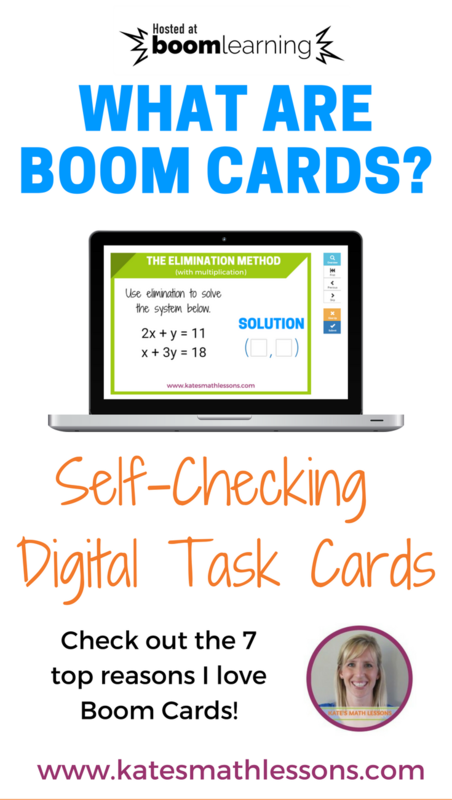 Want to make your own Boom Cards and aren't sure where to start? Have you already tried creating your own decks and need a little help making them look more polished? You're in the right place! I've created an online course that will walk you through the basics of Boom Learning and help save you time and confusion about how the process works. There's always a learning curve with new technology - let me help you! I'll walk you through the process of creating and publishing your own decks and break it down into manageable steps. 5 Days of Instruction: After signing up, you'll receive an email each day with a link to that day's activities. The links will be good any time, so there's no pressure to finish within 5 days if you're busy. You'll have access to all the material at the beginning, so you can finish early if you want! 18 Video Tutorials: The videos are short and sweet so you can complete one small task at a time. Each activity also includes written instructions with detailed diagrams. 100+ Background Images: I'll send you more than 100 different images you can use to create your cards. Includes a wide variety of borders, clip art, banners, and more to create professional looking cards. Don't worry secondary teachers, I've got plenty of simpler images you can use that will appeal to older students. 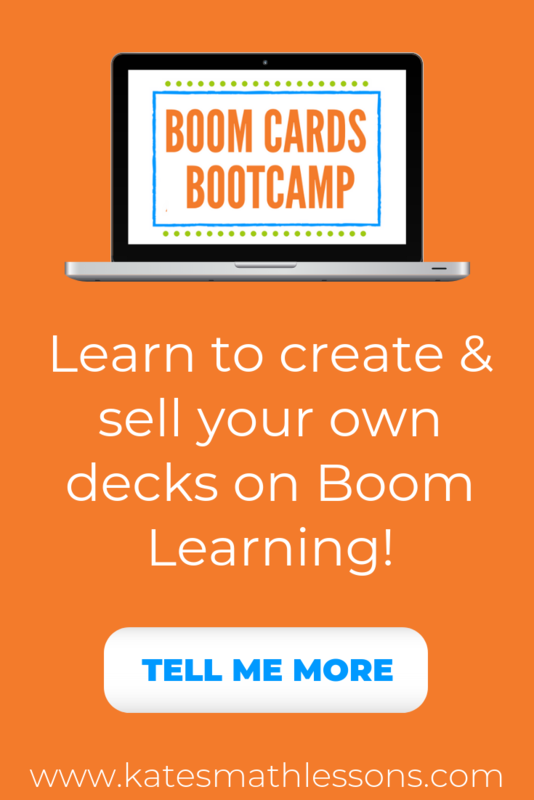 By the end of the Bootcamp, you'll have all you need to create your own customized decks, publish them to the Boom Learning Store, and start earning some extra $$ for all your hard work! 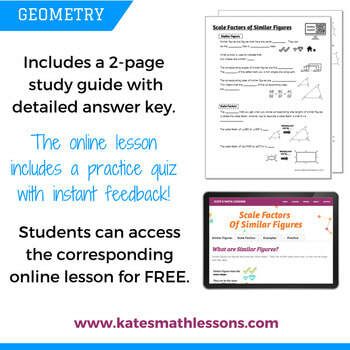 ​Kate's Math Lessons is an independent company and is not affiliated with or endorsed by Boom Learning. 1) Go to Boom Learning and click on the green Sign up button. 2) Join with your email, Facebook, or Google account. 4) Scroll down to the bottom and click on the green "Show me free stuff!" button. You can type in a specific topic in the search bar or refine the results by subject and grade level. 5) Click on the deck of cards that you would like to use and click on the Add to Library green button. Don't forget you can preview the first 4 cards of any deck - make sure to click on full-size preview to see how they work. Check out my free Order of Operations deck to see an example. 6) Next, click on Classes. You can now enter your name and picture (if you want). You may notice here that the membership information says you only have 5 students. Don't worry! You can always use the FastPlay option for free! I'll go into detail later on in the post, but there's a way for students to use the cards without needing to log in. The free plan includes unlimited FastPlay for as many students as you need, but it doesn't record their scores. If you want to be able to see reports for students or create your own decks, you can upgrade your membership plan (and currently at $15 a year for 50 students, that's not a bad deal if you ask me). 7)​ ​Create a classroom. Click on the blue "New Classroom" button at the bottom. It will automatically create a name based on what you entered in your profile. You can click on it and change it to Mrs. Smith's class, 1st period, Algebra 1, or whatever you would like to call the class. You can also change the username and password for your class. 8) Add students to your classroom. Option A: Add the students yourself. This is probably the best option if you have young students or only a few students. You can do this by clicking on "Add 1 Student" if you want to enter one at a time, or on "Add Many Students" if you want to add several at once. If you choose the second option, you just enter the names separated by commas and create a default password. Students can change this password when they log in (don't worry, you can reset it for those that forget their password!). Option B: Let students create their own accounts! I would recommend this option if you have older students. It's especially nice if you have a lot of students and don't want to type in all their names! You just share the classroom username and password with your students (write it on the board, post it in your Google classroom, etc.). Students go to Boom Learning just like you did, but they go to where it says Students and choose "Create Student" to make their own account. ​After they've entered the classroom username and password, they type in their name and create their own password. Assign: Click this to assign the deck to students. You can assign it to one class or multiple classes (or to individual students). If you choose this option, it will record student scores. 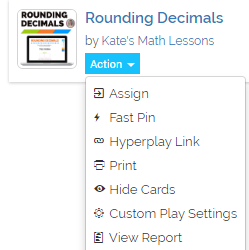 Fast Pin: Use this option if you want students to practice and don't want to record their scores. It will give you a link that students can use without needing to log in. Once students have this link, they click on the FastPlay option at the top and type in the pin to start. ​Hyperplay Link: This gives you a link that will prompt students to log in and then play will begin. Grab this link if you want to post it in Moodle, Google Classroom, etc. Print: Click this if you want to print a hard copy of the cards. Hide Cards: Use this if there are any cards in the deck you don't want students to see. Great option if the deck is too long or if there are cards that aren't quite what you were looking for and you don't want to assign them to students. P.S. 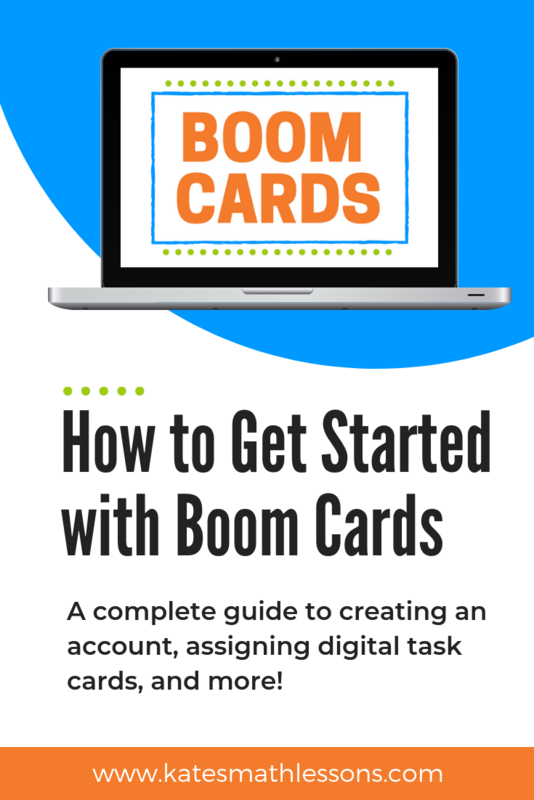 Want to learn how to create your own decks of Boom Cards? 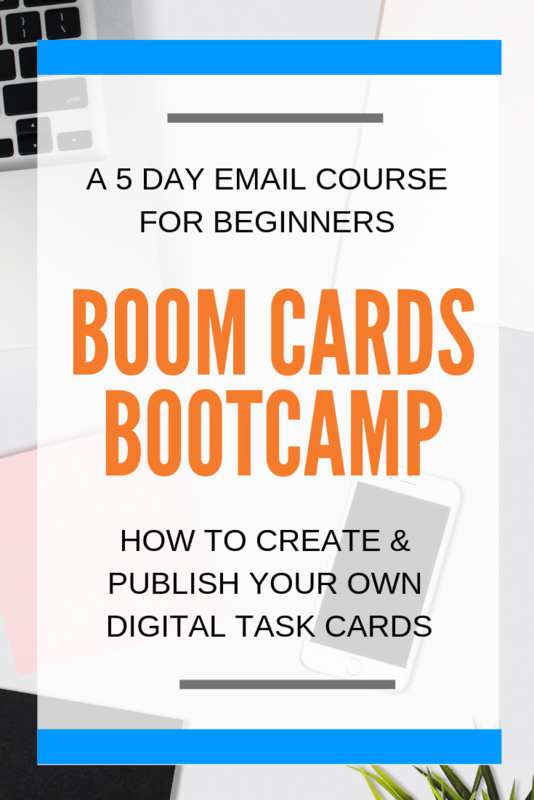 Check out my Boom Cards Bootcamp! It includes 18 short video tutorials and 100+ images you can use in your own decks! If there's anything teachers need more of, it's TIME! I am always on the lookout for anything that can save me time grading assignments. 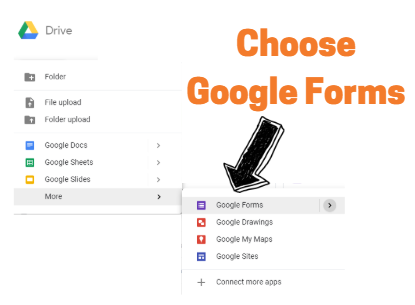 Did you know there's an add-on that can automatically a Google form? It's called Flubaroo and is FREE and super easy to use. 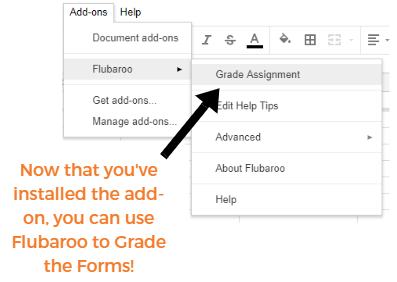 Check out the steps below to see how to use Flubaroo to automatically grade a Google Form! Open up your Google Drive and click the New button. Next, click on the Google Forms option (you may have to click on the More button to show the option). You can choose a template or start a blank one. Type your questions or upload images to use for your questions. You have several options for the type of answer you'd like students to submit: short answer, paragraph, multiple choice, etc. Click on the plus sign on the right to add another question. You can move questions around if you want them in a different order. I always make the first question ask for the student name and the second question ask for their email address. This makes it easy to identify the responses and you can set it up with Flubaroo to automatically email them their grades once they're done. ​Want to see an example of a Google Form? Check out this FREE Translating Algebraic Expressions Activity. Click on the SEND button at the top right of the page. You can enter student email addresses or get the link to share with students. Flubaroo needs to know the correct answers in order to grade the form you created. You can create an answer key by answering the questions in your form yourself. Use the same link you gave to students or email it to yourself and make sure to enter all the answers correctly to create the key. I usually type "Answer Key" as the name on the first question so it's clear which response is the one I need to use to grade all the forms. After students have completed the form, click on RESPONSES. You can scroll through and see an overview of all the answers or click through to see what a specific student submitted. In order to use Flubaroo to grade the responses, you need to click on the green button and create a spreadsheet in Google Sheets. After you click on the spreadsheet button, it will open up a spreadsheet in Google Sheets and will show all the student responses. Now you need to install the Flubaroo add-on (if you haven't already in the past) in order to grade them automatically. Click the Add-ons tab and choose "Get add-ons." Then type Flubaroo in the search bar and follow the installation instructions. The Flubaroo add-on should now show up in the add-on tab. Select "Grade Assignment" when you're ready to grade the responses. Flubaroo will give you options to change the point value of questions or to grade certain questions by hand. This works great if you have some questions that are short answer or paragraphs that you don't want graded automatically. Make sure to pick your response to use as the answer key! Flubaroo will create a new sheet that will show up at the bottom of your spreadsheet. It does a great job of giving you a summary of the responses and will even highlight in red students that received less than 70% (you can change this in the Flubaroo settings if you want). 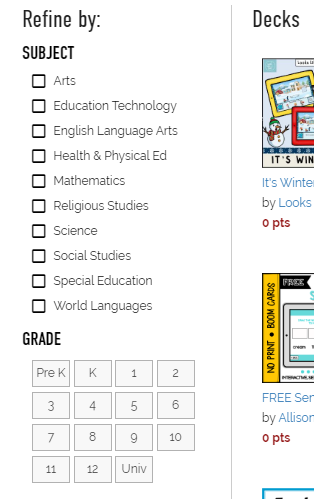 To share the grades with students, you click the Add-on tab again and it will now show an option to "Share Grades." This is an easy option if you want to email students their grades. Step 8: Enjoy your free time instead of grading! This may seem like a lot of steps at first, but once you've installed the Flubaroo add-on and tried the process once, the second time will go much faster! Trust me, this is an amazing time-saver for teachers! 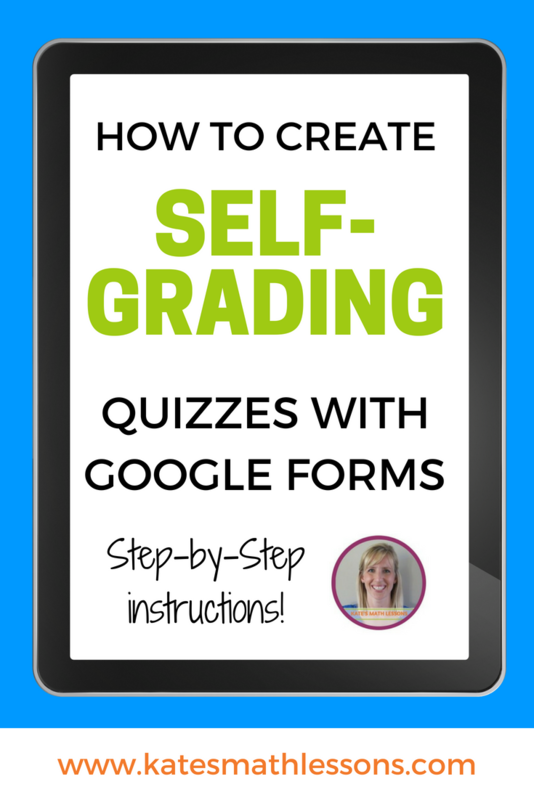 There are so many of my old assessments that I'm now turning into Google Forms to save time on grading. Need more help? Check out this video to see the process in action step-by-step. Looking for some extra ways to help students learn to factor quadratics? First, there are two FREE Algebra 1 lessons on factoring. The first is on factoring quadratics with a leading coefficient of 1 and the second is on factoring with larger leading coefficients. There's a great set of factoring quadratics task cards available to help students practice factoring on their own. You can print the cards with or without QR codes (students can quickly scan the QR codes to check their answers!). 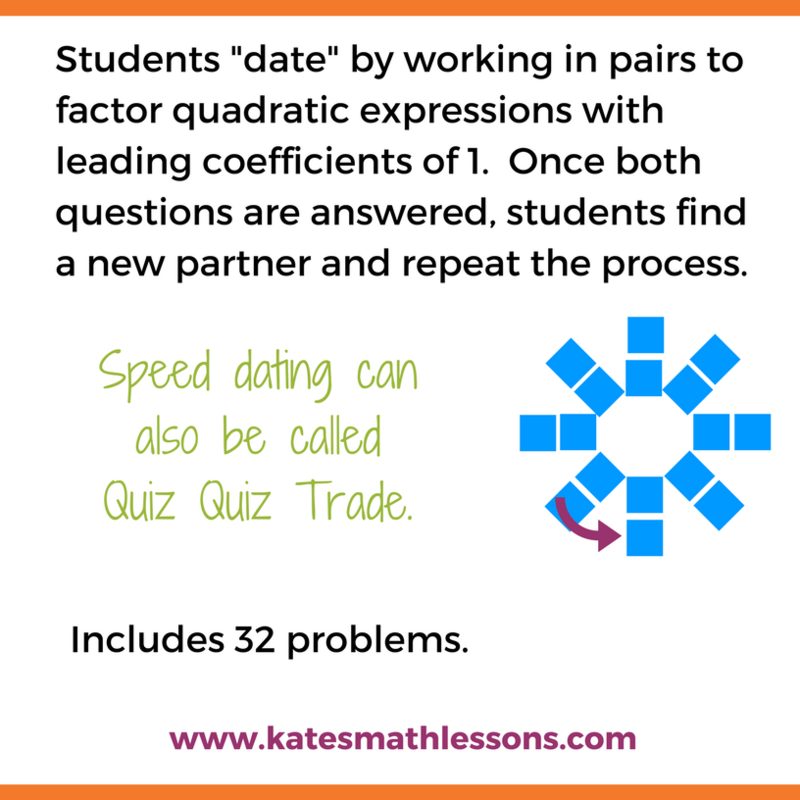 There's another printable activity available to accompany this lesson: factoring quadratics speed dating. Never tried speed dating in your classroom? It can also be called Quiz Quiz Trade. The idea is for students to quickly "date" as many other students as possible. Students form pairs and answer questions on small printed cards. They check the answers on the back, trade cards and quickly find a new partner to repeat the process. Looking for resources to help geometry students find scale factors of similar shapes? Check out the FREE lesson on scale factors. I've found that students usually struggle to figure out if the scale factor is going to be smaller or larger than 1. This lesson has lots of great examples to help students find scale factors of similar triangles, rectangles, and other similar figures. There's also a printable study guide you can print off for students to fill out as they follow along with the online lesson! Don't have access to technology in your classroom? You could also use the guided note sheet to use with whole-group instruction! Do your students struggle with rounding as much as mine do? It seems there are always middle school and high school students who haven't quite mastered rounding. 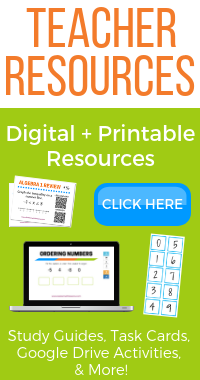 Here's a few resources that I hope you find helpful for your students! First, there's a FREE lesson on rounding to the nearest tenth and nearest hundredth. 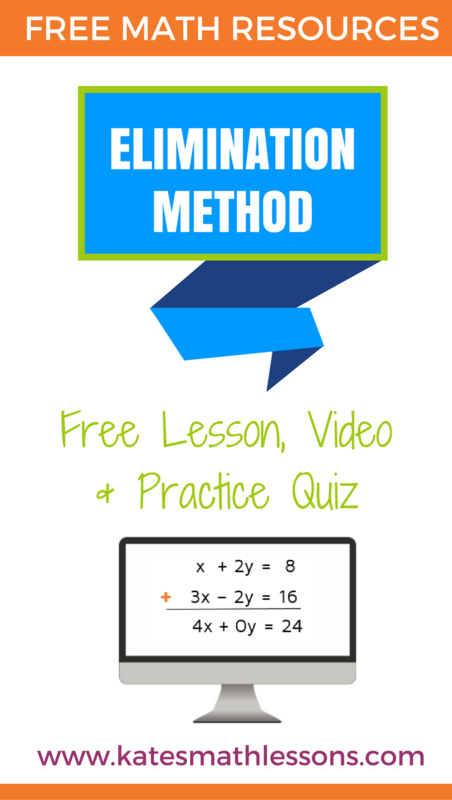 The lesson includes examples, short videos, and a practice quiz with instant feedback! I often direct students to this lesson if they need a quick refresher. If you're working on rounding decimals to the nearest tenth, hundredth or thousandth, there's also a fun rounding decimals speed dating activity. Never tried speed dating with your class? It's so much fun! (It can also be called Quiz Quiz Trade) The idea is for students to "date" classmates by pairing up and solving questions on little cards that you pass out. The answers are on the back so students check their work and then find a new partner to work on new problems. It's a great way to get students up out of their seats and working together on math! First, there's a FREE online lesson on converting percents, decimals, and fractions. The lesson has detailed examples and a practice quiz with instant feedback. The lesson also has a printable study guide (also FREE) that students can fill out as they go through the lesson. You can pass out study guides to students and have them complete the lesson on their own or you could use this study guide with a whole-class lesson.